No question about it ... Ken Smith really knows blackjack tournament strategy! 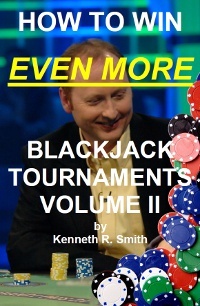 Volume I of Ken's Blackjack tournament series is also available as an e-book in our online store. His new e-book contains more of Ken's tournament playing and betting strategies that were published in his columns in the Blackjack Insider Newsletter (BJI), plus several new strategies, not previously published in the BJI (all articles are now only available in this e-book). You will learn more tips and tricks that have made Ken the best and most feared tournament player. Revisiting the "mythical 12 percent rule"
Whether you are a tournament novice or an experienced player, Ken's latest collection of strategies will give you more powerful insights that can elevate your game to the next level. "Ken Smith is not only one of the world's best tournament players, he is also a great teacher of tournament strategy. I highly recommend his new e-book." Kevin Blackwood, author of "Playing Blackjack Like a Pro." "This is the best Blackjack Tournament primer EVAR! It's concise, easy to read and understand, and it will set the budding recreational blackjack tournament player far, far above the average competitor." Max Rubin, author of “Comp City “and host of the annual Blackjack Ball. “Ken Smith may be the best blackjack-tournament player in the world and he's elevated the standard of expert play as much as anyone since Stanford Wong. When he writes about strategy, I read it. You should too." Anthony Curtis, Publisher of Las Vegas Advisor and a World-Class Tournament Player. "My worst nightmare is to have Ken Smith on my table in a blackjack tournament. My second worst nightmare is to be playing against opponents who have read Ken's e-books."... Henry Tamburin, editor of Blackjack Insider newsletter. 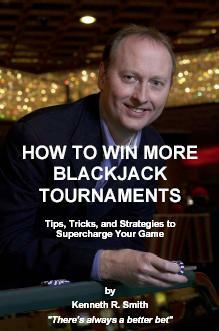 "I purchased and read both of Ken Smith's Blackjack Tournament e-Books. I played in two tournaments in Las Vegas, advanced in both, but wasn't able to cash-in. Then I entered another blackjack tournament in Atlantic City and won first place ($25K)! I followed the tournament strategies in your book. Knowledge is power ... thanks again."... one of thousands of happy and successful readers of the book. How to Win Even More Blackjack Tournaments - Volume II is 131 pages with a full cross-referenced index. Once you place your order in our secure store, you can immediately download the e-book to your computer where you can read it, save it, or print a copy (either using your printer or at a local print store such as Kinko's). The e-book is only available in Adobe Acrobat format from our BJI store, and can be read with the free PDF viewer software, available by clicking here. Technical assistance is available for customers with questions (e-mail us at qus@bjinsider.com).